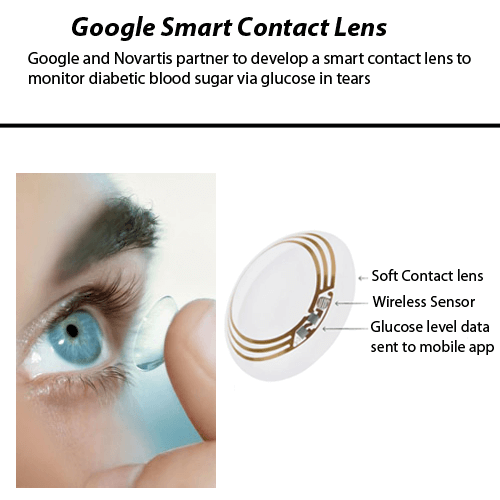 New smart contact lens will simplify blood glucose level monitoring.Google has recently announced that it is partnering with Novartis’ Alcon eye-care division to further develop a smart contact lens for the public market. This lens will to help diabetics track their blood sugar levels via connection to an app on a wearer’s mobile phone. In January 2014, Google introduced its smart contact lens development, with the aim of designing a more manageable way for diabetics to monitor their blood glucose levels.Many people are unaware of the additional daily routines that come with being diabetic, from checking glucose levels via painful finger pricks to injecting insulin, to carefully monitoring exercise levels and food consumption. It can be a physically and emotionally daunting process. But Google X’s research and development team and the company’s bulging wallets, ideally positioned them to tackle this growing health care problem head-on. With the International Diabetes Federation recently announcing that the world was losing the battle against diabetes the research team at Google found the motivation to make the smart contact lens project a reality. To ensure the glucose monitoring lenses work, the Google X squad placed a tiny wireless sensor in the middle of a soft contact lens. The sensor monitors the glucose levels in a wearer’s tears; if the glucose levels fall or rise too much, small lights turn on to alert the patient that he or she needs to take action to stabilize their blood glucose level. If these smart contact lenses work, it could bring an end to the daily hassle of checking glucose levels throughout the day. These smart contact lenses might soon be available to the public. Swiss pharmaceutical company Novartis (Alcon Contact lenses) has just this month announced that it will be partnering with Google to develop the smart contact lenses through an exclusive licensing deal and hopes to have the lenses available to the public within 5 years. “Our dream is to use the latest technology in the miniaturization of electronics to help improve the quality of life for millions of people,” Google cofounder Sergey Brin said in a recent press release. A smart contact lens could completely replace the frequent daily pinpricking a diabetic has to endure. There are also other possibilities beyond diabetes, since the tear fluid in your eyes also contain various proteins, lipids, electrolytes and other particles that could be monitored.The accompanying infographic shows how the smart contact lens would be used to measure glucose levels in the wearer’s tear fluid and transmit that data to a mobile phone app.